Summer is a time for gathering with friends and family. Make entertaining easy a simple pasta salad. I like pasta salads because they can be made ahead, saving you from being in the kitchen while guests are visiting. 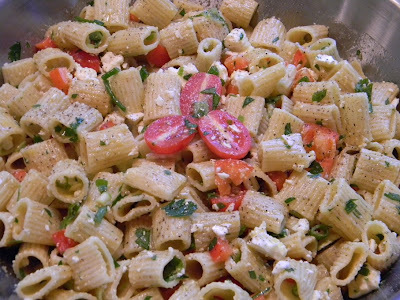 A lemon pasta salad is a fresh and easy recipe. Use any pasta you like, I typically use farfalle or rigatoni. Cook the pasta and let cool. Toss with olive oil to coat. Add everything else except the lemon juice; save it for adding just before serving. You may like more or less lemon, but don’t omit it, that is the key ingredient to give this pasta salad a fresh taste. Enjoy!